This topic provides an overview of the event submission process by describing what happens from the time an event is submitted until it appears on a live calendar. If you've opted to approve submitted events, you can also get advice for the best practices to follow for approving events, previewing events before you approve them, and more. How do I decide whether or not to approve submitted events? If you decide to provide an event submission form on your website, it's a good idea to go through the process of submitting a test event yourself so you can experience it both as the submitter and the approver/calendar editor. Submitter fills out the event submission form, reviews the submitted information, and then clicks Submit. When you set up your event submission form, you can add a custom message to the form's successfully submitted page. You can use the message to tell submitters approximately how long it will take for approved events to show up on the live calendar. If you don't add a custom message, a default message says approved submissions appear online within 48 hours. If you add a custom message to the submission form's successfully submitted page, you might also want to customize the confirmation email submitters receive by adding the same approval time information. If you opt not to approve events, submitted events appear on the live calendar as soon as Submit is clicked. Tip Because, without an approval process in place, submitted events go live immediately, it's usually a good idea to approve them first (as described later in this process). Learn more. Submitter receives a confirmation email. After submitters click Submit, a confirmation email message is automatically sent to the email addresses they provided along with their names, phone numbers (if you made phone number a required field), and event information. Submitters receive confirmation email messages similar to this one. By default, confirmation emails contain Withdraw event submission links that give submitters the opportunity to withdraw or cancel events they submitted. 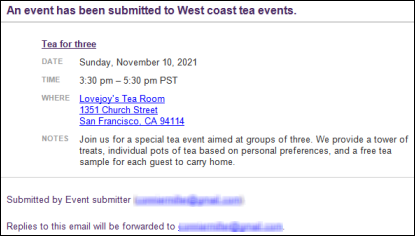 You can customize event submission emails to omit that option if you prefer. For more information, see What happens when submitters withdraw or cancel events. 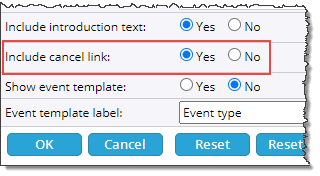 For more information about Event Actions, see Event actions options. When you set up the event submission form, you can list the email address(es) of calendar editor(s) who should be notified each time an event is submitted. If editors have questions about the submission, they can reply to the notification email to contact the event submitter. Designated calendar editors receive notification messages each time an event is submitted. If you opt to approve events, in the editing environment, submitted events appear on an unpublished sub-calendar of the published calendar. The sub-calendar is named Submitted, unless you changed its name during event submission form setup. After reviewing submitted events on the Submitted sub-calendar, calendar editors can follow best practices for approving the events. Or, if the events don't meet submission guidelines, editors can delete them from the sub-calendar. Tip Currently, no email messages are sent automatically to event submitters to let them know their events are live (or will not go live). Calendar editors can reply to the notification messages they receive to keep submitters informed. Submitters who sign in when submitting events can visit the My Submissions tab in the Event Actions web app to see the status of their submissions. For example, they can see when a submission is pending, has been accepted, or has been rejected (deleted). Tell me more about visitor accounts and the Event Actions web app. We recommend this approach for adding submitted events to the live calendar as you approve them. Taking this approach makes it easy to distinguish between the events you have approved and those waiting for approval. And, you can still easily keep track of how many events are being submitted and who submitted them. In the editing environment, click the name of the published calendar's Submitted sub-calendar to make it active. Click the event title for a submitted event that you're ready to approve. In the event form, notice the Submitter Email and Submitter Name fields that are added automatically to submitted events. Tip These Submitter... fields are hidden and are never published with events. Two hidden Submitter fields are automatically added to each submitted event. Tip If you require submitters to provide their phone numbers, you also see a third Submitter... field on the event form. These fields make it easy to track submitted events. For example, you can export the published calendar, and then sort by one of the Submitter fields. How do I export a calendar? Under Owning Calendar on the right, select the Submitted sub-calendar's published calendar. Changing a submitted event's owning calendar. This moves the event you're approving from the Submitted sub-calendar to the live calendar, and leaves, on the Submitted sub-calendar, only events you haven't yet approved. If a submitted event includes an image, a lot of text in the Description field, or any other unusual characteristics, you may want to preview the event before you approve it. 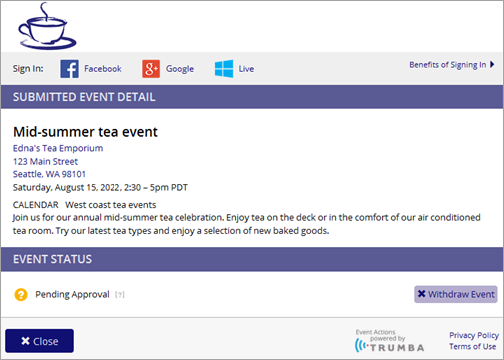 When you publish (but don't embed) a calendar, the calendar is hosted on the Trumba® website. Hosted calendars are not searchable and they can be password protected. Publishing the Submitted sub-calendar gives you the opportunity to preview submitted events in the hosted view so you can see them on a published calendar before you actually approve them. I could use a refresher on how to publish calendars. By default, the published sub-calendar is not searchable. To add an extra layer of security, you can password protect the sub-calendar. I'd like more information about controlling access to the Submitted sub-calendar. To preview events in all of the calendar views you offer to website calendar visitors, you might want to copy, to the Submitted sub-calendar publication, the settings and styles from one of your live publications. How do I copy settings and styles from one publication to another? Tip If the live publication you copied from is searchable, be sure to set the Submitted sub-calendar back to unsearchable after you finish copying. Tell me how. In the Publishing Control Panel, click the Hosted View tab, and then, in the bottom left corner of the Hosted View section, click Preview. The hosted view opens in a new window. Preview the event on the hosted view calendar. If you published multiple views, use the View Chooser spud to preview the event in each view. Click the event title to preview the event detail view. When you're finished, close the hosted view window. Tip If you optimized your calendars for mobile devices, you might want to preview the submitted event using a phone or tablet. In the Publishing Control Panel, click the Calendar Spuds tab. In the Main Calendar Spud section, click Edit Styles & Settings. For Automatically detect mobile, select Yes, and then click OK. Click the Hosted View tab. In the Hosted View section, find the hosted calendar URL. Use a browser on your mobile device to navigte to the URL to open the hosted calendar page. Clicking a Withdraw event submission link in the confirmation email they received when they submitted their events. Opening the Event Actions web app and navigating to the My Submissions page. Note Only submitters who signed in to their visitor accounts to submit their events have this option. Watch a short video that describes event submission sign-in and withdrawing and canceling submissions using the Event Actions web app. I'd like to watch the Introduction to Event Actions video first. When you customize the event submission email, you have the option to provide or omit a Withdraw event submission link from the confirmation email that submitters receive. Option to provide or omit a Withdraw event submission link. Select No to omit the link. How do I open the form where I set the withdraw and other event submission email options? If you provide the link, the withdrawal process starts when, in the confirmation email they receive, submitters click Withdraw event submission. 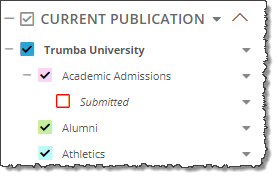 In the Event Status section of the webpage that opens, submitters see the submission status and an action button (unless the status is Deleted). Learn more about submission status and action buttons. Submitters with visitor accounts who sign in to submit events can manage their submissions by navigating to the My Submissions page in the Event Actions web app. I'd like more information about visitor accounts and the Event Actions web app. On the My Submissions page, submitters see the status of each of their submissions and have the opportunity to withdraw or cancel each submission. 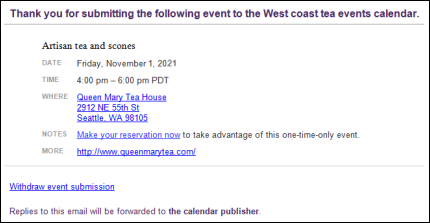 Event submitters see one of three statuses, depending upon the actions you as the calendar owner or editor have taken. Pending You have not yet approved the event and moved it to the live calendar. If the submitter clicks Withdraw Event, the event is removed from the Submitted sub-calendar and the calendar editor receives an email message announcing the event that's been withdrawn. Approved The event is live on your published calendar (either because you approved it or you chose to let events go live without approval). If the submitter clicks Cancel Event, the event stays on the published calendar but is marked as canceled. Deleted The event did not meet your requirements and you deleted it from the Submitted sub-calendar or the live calendar (if you decided not to approve events before they go live). Note Submissions signed-in visitors withdraw stay in their My Submissions lists and are also marked as Deleted.